BAGHDAD, Iraq (CNN) -- A roadside bomb targeted a police patrol in the northern Iraqi city of Kirkuk, killing a civilian bystander Thursday, a police official told CNN. 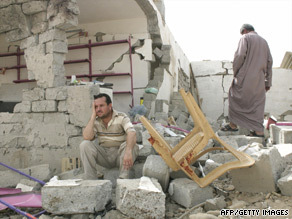 Iraqis survey the damage after car bombs were detonated within minutes of each other in Mosul, July 9. It is the latest in a series of attacks across Iraq that have killed at least 64 people and wounded 167 others over the past two days. The deadliest attack happened earlier in the day when a double suicide bombing killed at least 35 people and wounded 65 others in the city of Tal Afar in Nineveh province, also in northern Iraq. Political tensions have recently increased in the region between Arabs and Kurds. The Tal Afar bombings occurred a day after attacks on mainly Shiite targets in Nineveh province, including a car bomb in a Turkmen area of the provincial capital Mosul, left at least 19 people dead and dozens wounded. U.S. forces pulled out of Iraq's urban centers June 30. The U.S. military had suggested keeping its combat troops in Mosul beyond the withdrawal deadline, but the Iraqi government insisted on making no exceptions for the date set in the security agreement. Also on Thursday morning, at least seven people were killed and 25 wounded when a bomb detonated in a busy marketplace in Sadr City, the vast Shiite slum in Baghdad, an Interior Ministry official said. Bomb blasts from a rigged bicycle a car in two predominantly Shiite neighborhoods of southwestern Baghdad wounded six people, according to the official. In Baghdad's central Karrada district, a roadside bomb targeting a convoy of Iraq's Central Bank governor killed one civilian bystander and wounded five, another Interior Ministry official told CNN. The governor escaped unharmed.